The world's most effective source code plagiarism checking solution. Find unoriginal code with the most advanced plagiarism detection solution. 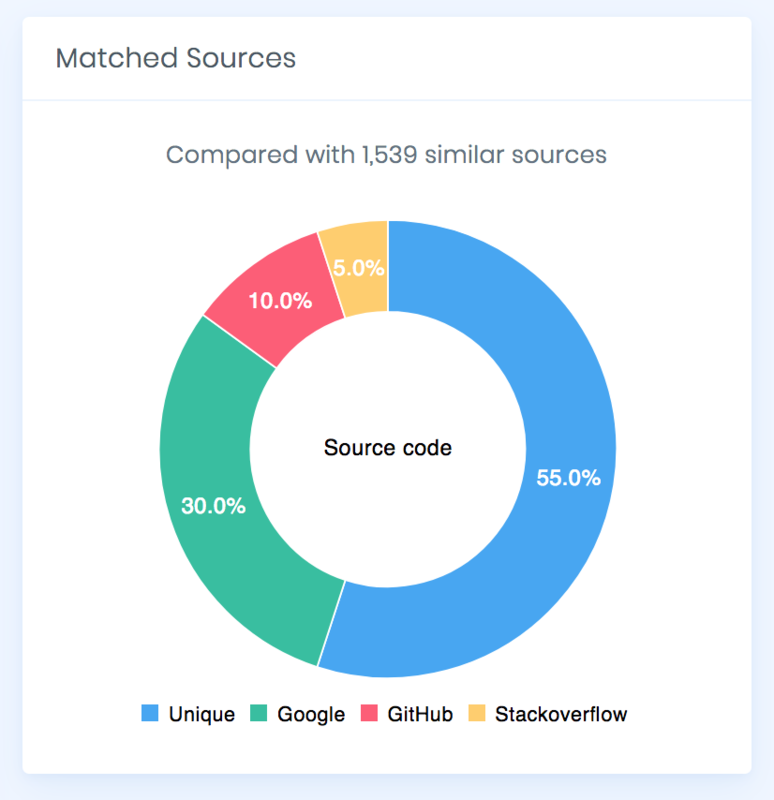 Investigate potential copied code by highlighting similarities to billions of sources along with peer submissions. Our modern solution to a modern problem is powered by artifical intelligence, putting a stop to plagiarised code, while constantly learning and detecting new strategies used by cheaters. 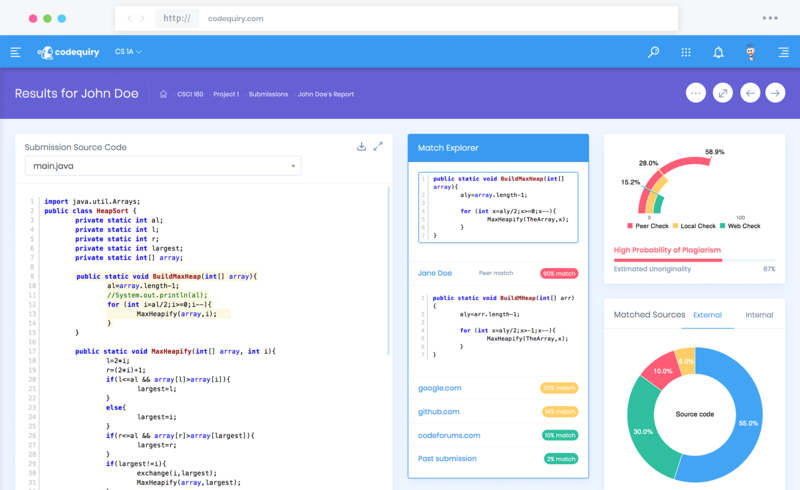 Codequiry's AI engine focuses on finding logical similarities, meaning that altering variables, whitespace, function names, or comments will not affect overall results. 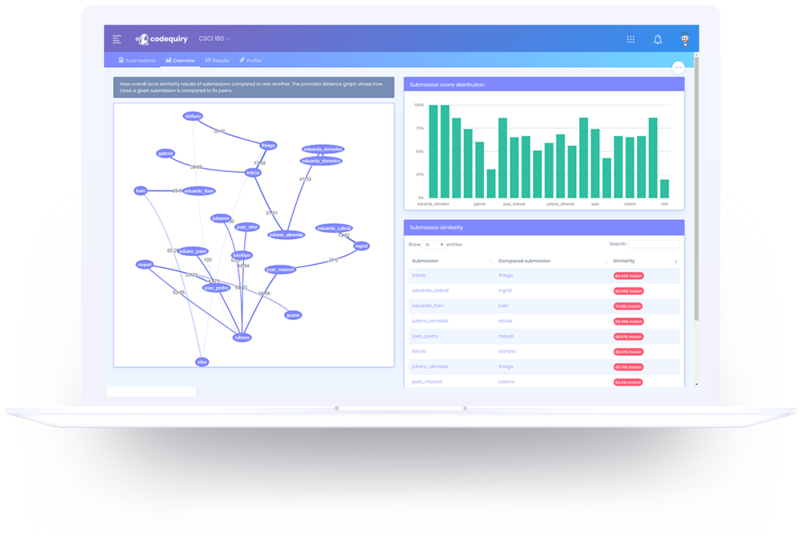 Codequiry was built around source code detection, this means the results you get are meaningful and reliable. Submissions undergo rigorous checks (more) to ensure that students' codes are original. If a submission is flagged, chances are something suspicious is going on! Compare with Peer Check (get similar matches and visual tools for a group of submissions) as well as Database and Web Check (compare submissions against over 100 million sources in our database or over 2 billion sources live on the web)! 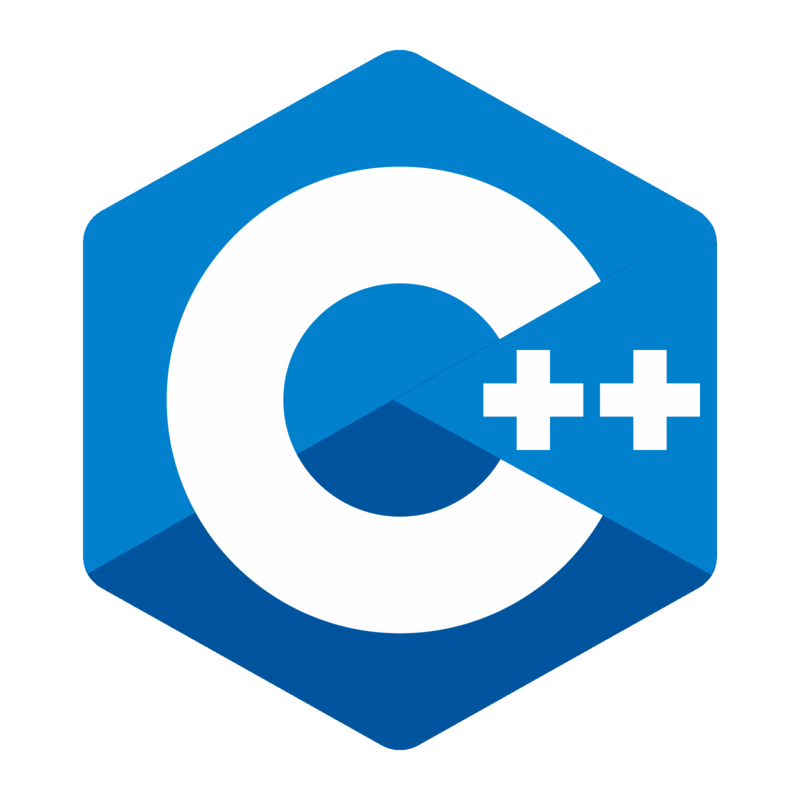 Codequiry works with the majority of popular programming languages. Additional languages and updates are constantly being added. Codequiry's results are extremely detailed and allow you investigate any suspicious copying. We bet that a few minutes is worth the cost of ensuring a fair academic enviornment for all computer science students. 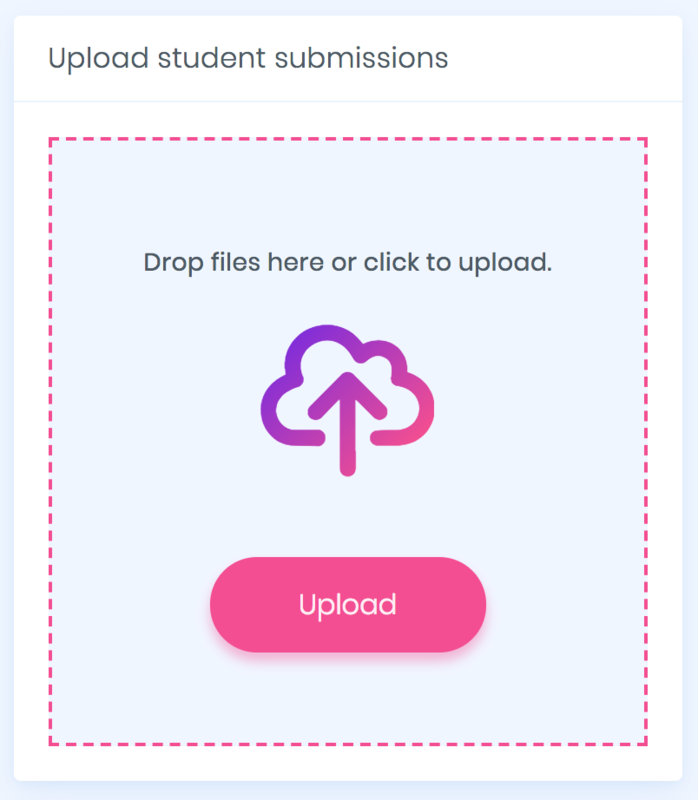 Just drag'n'drop student submissions and let us take care of the rest with our easy to use standalone platform. Codequiry empowers educators by ensuring that students are learning and not just copying code. 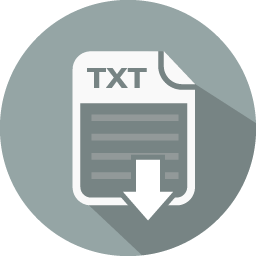 If you are using our standalone, just bulk upload your students' files. If you are using LMS Integration, just link your account and Codequiry will pull assignment submissions automatically. Codequiry will run two main checks: a peer check and deep check. 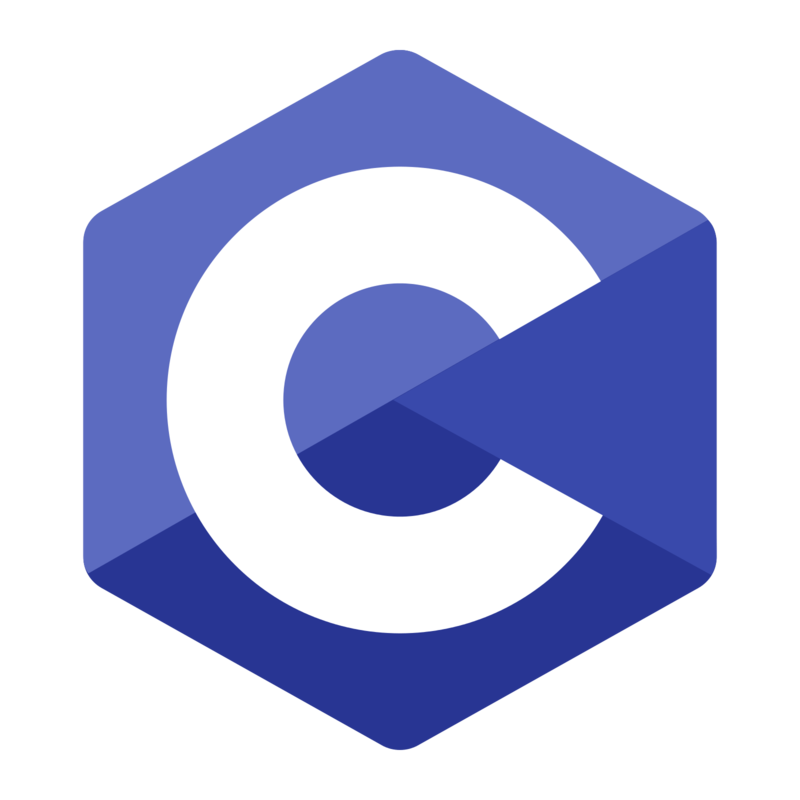 The peer check will compare source code to every other student's submission using AI. The deep check will look for similarities to code from billions of sources on the web. Once final checks are completed, we will notify you through the medium you prefer if there any any suspicious submissions. A detailed plagiarism report and additional insights will be available to you along with visual graphs and charts. Codequiry is built for computer science teachers/professors (K-12-Higher Education) and industry professionals who wish to check code simlarity and originality. Codequiry ensures that your academic and business enviornment is fair for all persons. How long does it take to start using Codequiry? Is there a submission limit? No, you may run unlimited peer checks. Pro Checks (external web and database checking), however are are charged on a per submission basis. How do I properly submit files? When uploading a submission, you must drop or upload zip files. Each zip file should contain all the submission's source files, the structure does not matter. Each zip file represents one submission, meaning a zip file containing multiple submissions will not work. 10 submissions for example can be represented by 10 individual zip files containing each submissions source code files for the selected programming language setting. Do you support direct integration with Canvas so that student submissions can be directly sent to Codequiry? We are currently working on Canvas/LTI Integration for student assignment checking. Stay tuned! Are there any costs for the students? No, and we do not intend to charge students in the future. How can we test out Codequiry? Currently you may start with a risk free trial and cancel anytime without charge. What programming languages does Codequiry support? 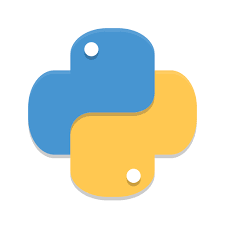 We currently have advanced support for Python, Java, C++, C# and C. You may also run checks using plain text files (.txt). 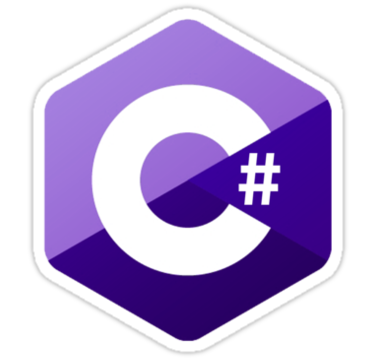 We are constantly adding new language parsers and improving support for existing ones. How do I know which portions of code are plagiarized? If there are matches or simlarities found in a submission, you will be able to see them on the Results page. Local similarity matches are highlighted, and external matches are displayed in the match explorer. If there are no matches or results available, then no matches with adequate tolerance were found. What is the difference between Peer Check and Pro Check? Peer Check is a purely local similarity matching system. 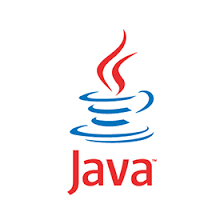 This means all the code is compared thoroughly to other files provided in the check. If you wish to compare source codes to a limited data set, then Peer Check is the best solution. Pro Checks are external checks, meaning all the provided files will be compared not only locally, but also across the web and public repositories (estimated 200 million sources). Due to the exaustive nature of this check, Pro Checks are charged at a rate of $0.05 per submission (minimum of 500 - $25/month). Codequiry's goal is to make a computer science education fair and equal for all students by preventing the use of unoriginal code. Together we can preserve a culture of academic integrity.